Every time I’ve looked at this photo, I’ve assumed it was taken by this woman’s son or daughter, but posting it now, I realize it could have been taken by anybody and labeled later by her child. That certainly opens up some extra scenarios for the possible story behind this moment. Also, when looking at it in the past, I’ve noted the year, but the date only sank in just now. Doesn’t her outfit seem a little summery for the last day of November? It makes me wonder whether this was taken in a warmer climate than I had assumed. Or possibly she took her coat off to display her pretty dress for the photo. Or perhaps she’s a woman made of sterner stuff, unaffected by a wintry chill. 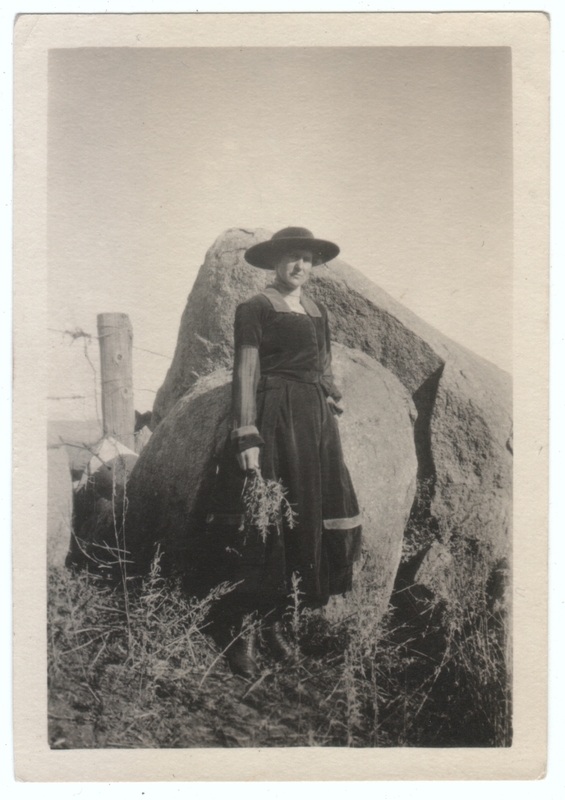 Her outfit also seems too delicate to be tramping through tall weeds to get to that rustic location. True, although her boots seem up to the task. There may also be something we’re not seeing, like that she may be just a few feet off the road. Hard to say. Her outfit does have transparent sleeves, but the rest of it looks like it’s made of heavy velvet, and I think there might also be a high-collared something underneath. Plus petticoats. Looks warmer to me than the “fall shorts” being advertised right now! Good points. And it’s not like she’s standing in snow. I love your blog, keep up the great work. I find photos like these so interesting and am fascinated about the history of what went on in each photo. Such a different and interesting blog. Thank you so much, Ellenor! I’ve enjoyed browsing through yours, too. I think it’s definitely fascinating to look at these photos as a window into what life was like, and to try to understand the circumstances surrounding the images. I hope you continue to enjoy it.